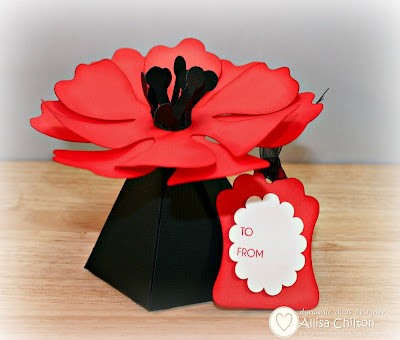 Today, I am featuring one of the many 3-D projects found on the New Cricut Artiste Collection. I think I am on a mission to cut all the projects...which is going to take quite some time! I thought this little flower box would be perfect for Dynamic Duos Challenge this week. 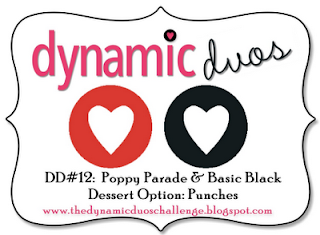 The challenge this week is to create a project with Poppy Parade and Basic Black. You can add the dessert option by adding punches to your project. I made my project with Holiday Red and Black by Close To My Heart. I am fairly certain this is a hibiscus flower. At least that is what it reminds me of! The box is one cut with the Artiste cartridge and the flower is an accent piece on the same button. 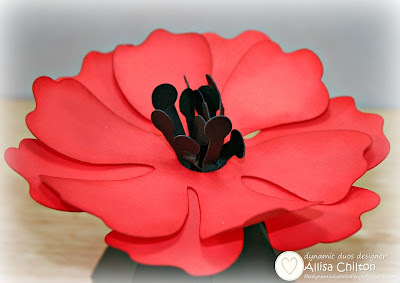 I sponged Holiday Red ink on the edges of my flower and rolled the edges to give more dimension to the flower. The gift tag and layer were also cut with the Artiste cartridge. The gift possibilities are endless! I think these would be really cute for table decorations as well. Thanks so much for stopping by! I can’t wait to see your creations over at Dynamic Duos. Be sure and stop by and see what the DT members have created! I'm swooning over this pretty little creation Allisa The center of your flower is fabulous! Lovely, thanks for joining us at 4 Crafty Chicks challenge, Make a Box. Great job! What a breathtaking flower! Very amazing! This is stunning. You are having fun with your new Cricut Designs. Absolutely fabulous project, gorgeous colour...Thanks for joining us at Divas by Design & Fab'n'Funky this week. Allisa, this is so pretty. The black stamen add the WOW factor to the project. Thanks for playing with us @ Alota Rubber Stamps! OMGOSH this is sooooo cool! I love this little flower box :) Thanks for joining us this week at 4 Crafty Chicks - awesome job! Oh how fabulous! Love that box shape and your flower looks so real. I'm lusting after the Artiste cartridge and this is another great project to drool over! Thanks for playing along at Fab'n'Funky Challenges. Be sure to check out our next challenge. Your choice in colors for this project were superb! I'll be hard-pressed to see another 3-D project like this one and not immediately want to compare it to your fantastic work. You inspire! The red flower is just STUNNING on top of the black box - what a great little gift box! That is so gorgeous! I am in love with this flower! Thanks for playing along with Scrap It Girl! I love this, most of the boxes we saw at convention were one color, the two tones show this box pattern off perfectly! I always love your projects Allisa, but this one really WOWs me! How beautiful!! Allisa, this is stunning and very creative. You did an amazing job with the flower. It looks very realistic and so beautiful. Its always a pleasure to see what you do next. Oh My goodness this is wicked cool! Love the colors, the layout and oh how you made it look so elegant. Thank you so much for sharing your wonderful creation with us at 4 Crafty Chicks. WOW - what a fabulous project for the DD challenge. Just beautiful! I absolutely love this project! Thanks for joining in the challenge at Scrap It Girl! This is so pretty! Love the black and red combo! Thanks for joining us for ScrapitGirl's July challenge! Wow, that red really pops! Looks great, thanks for entering at Scrap It Girl, good luck!